Can extreme adversity give you a stronger purpose? Production Coordinator, Author, and Social Entrepreneur Harley Blakeman brings a whole new meaning to leading with conviction. His first entrepreneurial venture landed him in prison at the age of nineteen and permanently branded him a convicted felon. Instead of working to hide past mistakes, he leverages his underdog story to inspire and teach others how to overcome their criminal histories. For Harley, Convicted leadership is more than a cool term he coined - its about being a role model for others and showing the community what’s possible. Join DACA Time, a Columbus social enterprise, to learn about the current state of DACA and about the Dreamers it affects. We'll get you caught up on the political landscape, help dispel common misconceptions, and answer your questions! Exclusive opportunity to participate in an interactive simulation giving participants insight to the lives of those experiencing generational poverty. This session will span the time of the first two breakout sessions and is limited in number of participants. Hear from Lily Vail, lead of Kiva Columbus, and Anique Russel, owner/founder of Too Good Eats and Kiva borrower. They will be sharing the Kiva story, and you will gain insight into the impact that micro-loans have on financially excluded entrepreneurs whose options for accessing capital are limited. Rachel Sumekh, CEO & Founder of Swipe Out Hunger, will discuss how she is feeding those in need by utilizing students’ meal plans and why she decided to use a social enterprise model. If you're going to start a company, sooner or later you'll find yourself needing to give an "elevator pitch," or a description of your company in 60 seconds or less. GiveBackHack is here to teach you how! What’s All the Buzz About Social Enterprise? Learn from Molly Tafrate of SocialVentures about the foundations of social enterprise by understanding the existing organizations in and around Columbus, OH. Walk away with a better understanding of how you can learn more and become a part of the movement towards non-negotiable, sustainable social change. Learn about how the Ohio Prison Entrepreneurship Program has brought startup curriculum to a local institution, empowering the currently incarcerated to begin a positive transition back into society as self-employed. Swipe Out Hunger is working to alleviate hunger by enabling students to donate unused meal points to feed food-insecure peers and community members. Come hear how their CEO/ Founder, created and leveraged positive relationships with large institutions to achieve success. Bogg is a mobile food pantry in Dayton, Ohio that feeds over 40,000 people each year. 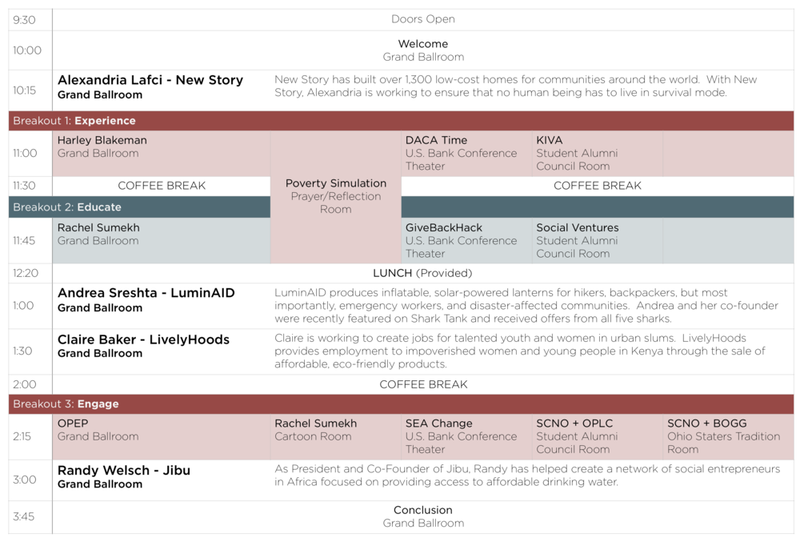 Come hear about their impact and brainstorm solutions to projects they are working on. The Ohio Poverty Law Center is a nonprofit law office advocating for policies to protect and expand the legal rights of low-income Ohioans. Come learn about their work and brainstorm sustainable fundraising solutions. So you’ve got an Idea… now what? You have an idea. Maybe an idea that has been rolling around in your head for awhile, or maybe it’s new. How do you know if it’s a good idea? What do you do if you want that idea to become reality? Come discuss tools, tips, and tricks needed to move your idea or early stage business forward.